I just found this in all of the documents I got & it didn’t even occur to me that John Pennington Jr our former DEM had been convicted of Domestic Violence in 2007 yet the Snohomish County Sheriff thought it would be a good golly gee swell idea to give him a gun permit. It says the license expires in 2010, so that means it was issued in 2005 well before the DV but then he loses it & has to get a replacement. Lovick just hands it over to him, no questions asked, no background check, not a peep. (g) He or she has been ordered to forfeit a firearm under RCW 9.41.098(1)(e) within one year before filing an application to carry a pistol concealed on his or her person. (2)(a) The issuing authority shall conduct a check through the national instant criminal background check system, the Washington state patrol electronic database, the department of social and health services electronic database, and with other agencies or resources as appropriate, to determine whether the applicant is ineligible under RCW 9.41.040 or 9.41.045 to possess a firearm, or is prohibited from possessing a firearm under federal law, and therefore ineligible for a concealed pistol license. (b) The issuing authority shall deny a permit to anyone who is found to be prohibited from possessing a firearm under federal or state law. (c) This subsection applies whether the applicant is applying for a new concealed pistol license or to renew a concealed pistol license. (4) The license application shall bear the full name, residential address, telephone number at the option of the applicant, date and place of birth, race, gender, description, a complete set of fingerprints, and signature of the licensee, and the licensee’s driver’s license number or state identification card number if used for identification in applying for the license. 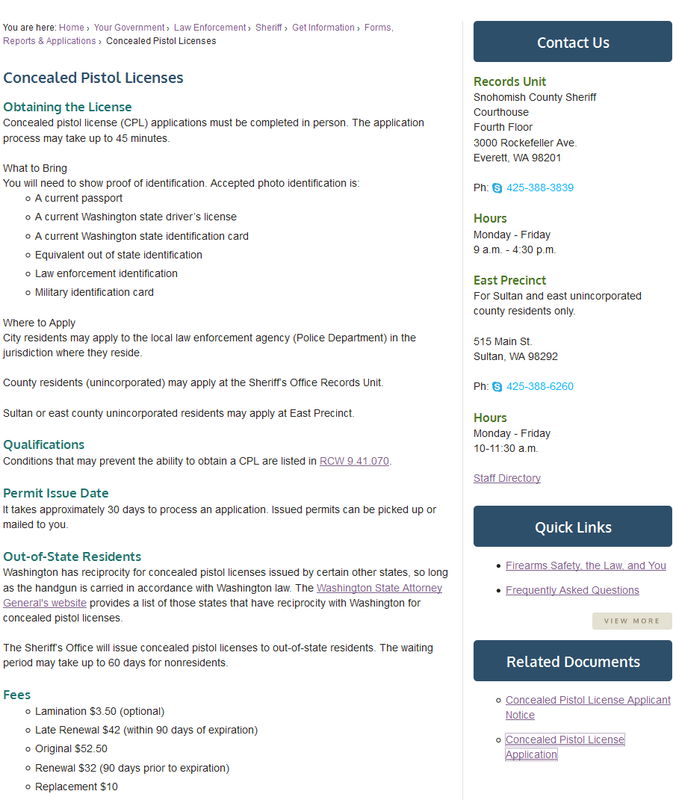 A signed application for a concealed pistol license shall constitute a waiver of confidentiality and written request that the department of social and health services, mental health institutions, and other health care facilities release information relevant to the applicant’s eligibility for a concealed pistol license to an inquiring court or law enforcement agency. (11) A political subdivision of the state shall not modify the requirements of this section or chapter, nor may a political subdivision ask the applicant to voluntarily submit any information not required by this section. (12) A person who knowingly makes a false statement regarding citizenship or identity on an application for a concealed pistol license is guilty of false swearing under RCW 9A.72.040. In addition to any other penalty provided for by law, the concealed pistol license of a person who knowingly makes a false statement shall be revoked, and the person shall be permanently ineligible for a concealed pistol license. (b) Unlawful possession of a firearm in the first degree is a class B felony punishable according to chapter 9A.20 RCW. (8) For purposes of this section, “intimate partner” includes: A spouse, a domestic partner, a former spouse, a former domestic partner, a person with whom the restrained person has a child in common, or a person with whom the restrained person has cohabitated or is cohabitating as part of a dating relationship. 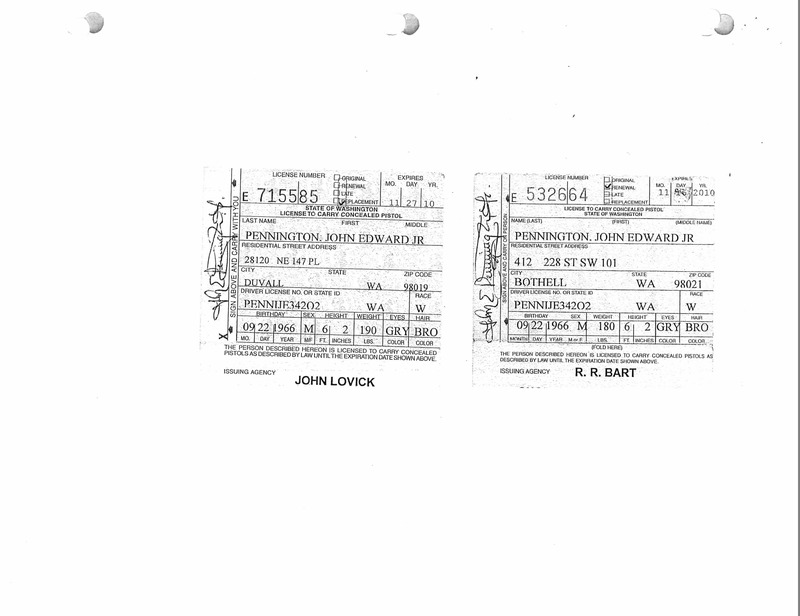 We KNOW that Pennington was convicted in 2007 of DV & harassment. At which time his concealed weapons & right to own a gun would’ve been revoked. Still think Lovick is the right guy for the job???? He can’t even run a simple background check that is required by law. Nevermind about all the people who have died at the Snohomish County Jail under his watch. So how many other felons & abusers are walking around with guns? « Who “owns” the Sky Valley Chronicle ~ Time to investigate the SnoCo D.E.M. Lovick issues concealed weapons permit to convicted wife beater… The cover ups & nepotism in this corrupt county has got to end. How long is going to be before some woman or child ends up dead?